The best way to have an intimate experience in Morocco is to stay in a riad. 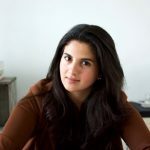 Learn more about Moroccan riad archictecture. One of the delights of visiting Morocco is the chance to stay in beautiful accommodation. Throughout time this country has been shaped by African, Arabic and European traditions. These influences are reflected so openly in the stunning riads found in enclaves of the medina and cobbled lanes in old walled centres of the cities. 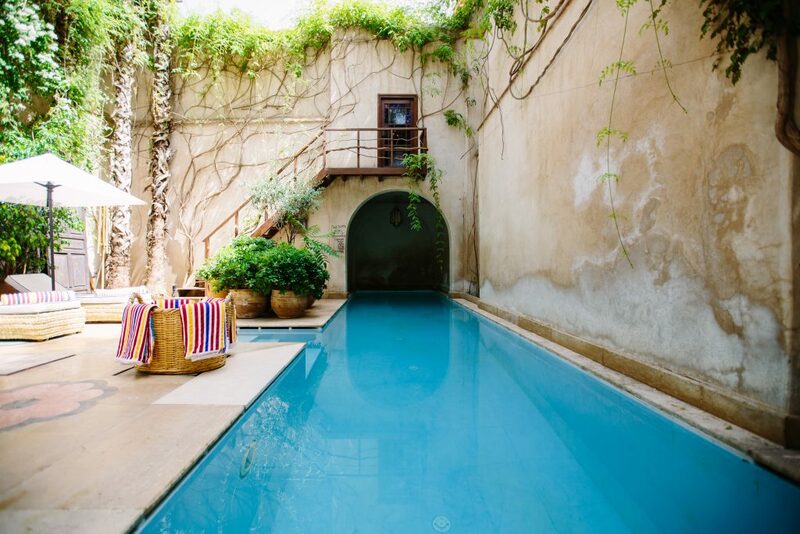 Don’t pass up the chance to stay in these one-of-a-kind mini-palaces while staying in Morocco. Riads allow visitors to enjoy an authentic local experience along with an opportunity to live in a space where they can encounter the country’s distinctive architectural style intimately. If you want an appreciation of what goes into creating this unique style of home, brush up on Moroccan riad architecture with our guide. 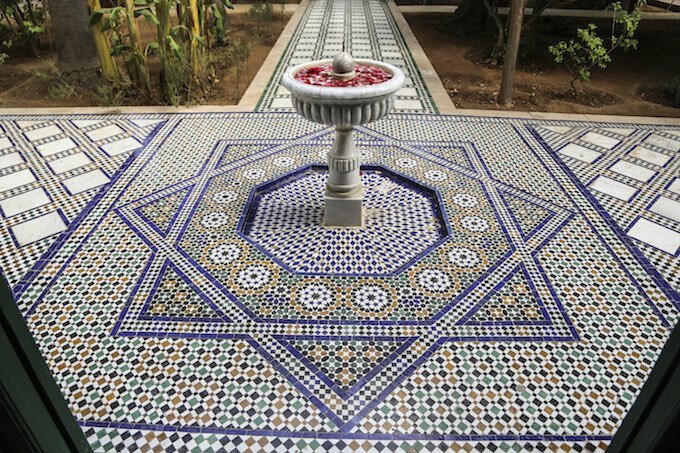 The word riad has its origins in the Arabic word for garden. The original aesthetic for these traditional Moroccan homes built during the Idrisid Dynasty — an Arab Zaydi-Shia dynasty that ruled the country from 788 to 924 — came from Volubilis. This ancient Berber city was at one time part of the Roman Empire, and riads evolved from Roman villas. After Spain was conquered by the imperial Almoravid Berber Dynasty, Muslim, Christian and Jewish artisans came from Andalusia to Morocco and inspired many of the design elements found in riads today. Back then these homes were the dwellings of members of the royal court and wealthy merchant families. Over time they have been renovated (some modernised with amenities) to provide unique lodgings for travellers staying in Morocco. One of the things that distinguish a riad is its design. 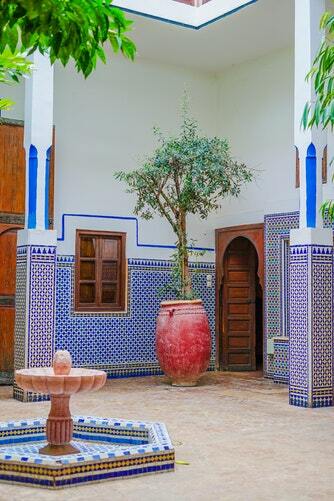 Riads often have two or more stories, and at the heart of these homes is an open Andalusian-style courtyard often with a fountain, or pool, or garden. These courtyards are usually adorned with tile art and Arabic calligraphy with quotes from the Quran, and you may even see a handful of lemon or orange trees. Riads are created in such a way that all the rooms have windows and balconies facing inwards to the courtyard instead of overlooking the street, a humble door on the outside encompasses the riad’s entrance. The reason that riad face inwards is two-fold. On the one hand, the design of a riad allows families to enjoy their privacy (keeping with Islamic cultural norms), and on the other, it gives them cooling respite from the hot weather of the region. Riads do not have a closed roof, the rooms tucked off the central courtyard are enclosed within the building, but the courtyard is open to the heavens. The style of riads has changed significantly, but the concept of the courtyard at the centre of these traditional homes has remained and still influences the design of them today. Many crumbling riads in popular cities like Marrakech or Essaouira have been restored into hotels and transformed into glamorous guesthouses, many of them made famous, by Instagram and the travel magazines. The neighbourhoods of Mouassine and Laksour in Marrakech have excellent examples of restored Moroccan riad architecture: grand Saadian palaces living another life. Many riads in Morocco have been bought up by foreign investors, renovated with unique interior design elements and turned to a premier option for travellers looking for lodging that feels akin to the lap of luxury. Plenty of the modernised riads are in Marrakesh and quite famous. El Fenn has been heralded in almost every publication, the riad’s general manager took his interior design skills to Riad Les Yeux Bleus, which has become equally as renowned. Some larger riads renovated from palaces have more rooms and are more like hotels than traditional homes, Royal Mansur, for example. They still resemble riads but are much more lavish. If you want a more local experience, opt for one of the small locally run riads, which only have a handful of rooms — this way you get to know the host and have a more intimate stay. It’s not uncommon to see travellers fresh off the plane carting their suitcases through the maze of streets in the medina looking for their riad. For people looking to discover Morocco intimately, this is the way to go. 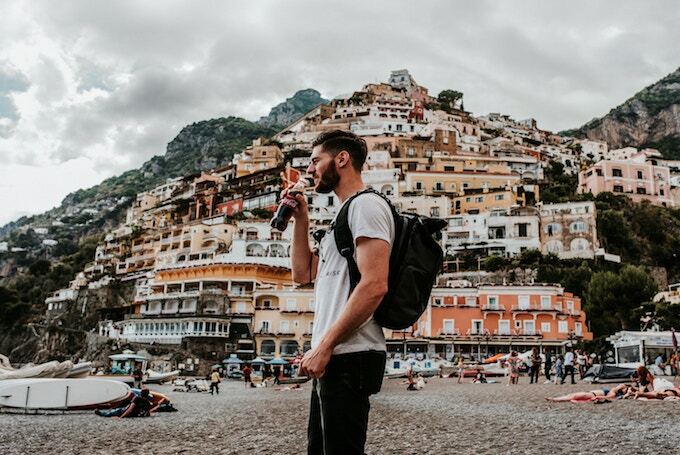 Not only do visitors get to live in the historic areas of these amazing cities, but it’s also an immersive way to experience the local customs and rituals. 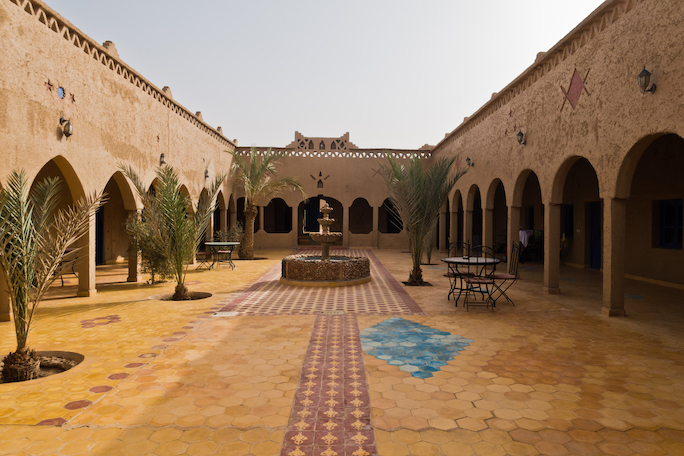 Many riads offer activities like cooking classes, tile painting or pottery. 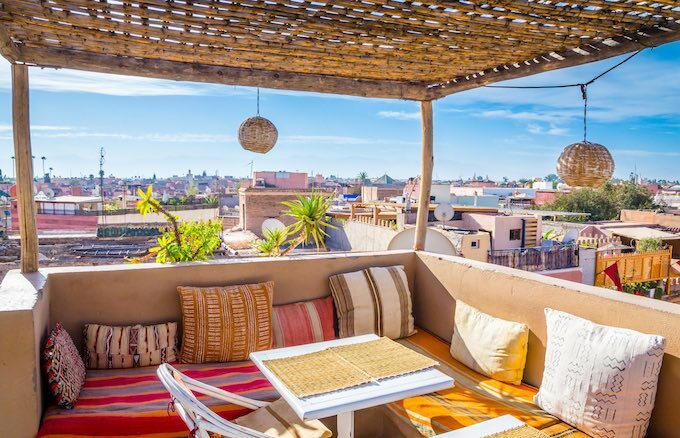 From waking up to a traditional Moroccan breakfast to sipping tea in the courtyard after the sun goes down, and lounging on Berber rugs, plush sofas and embroidered cushions, you’ll feel like Moroccan royalty in even the more modest riads. And you won’t have to break the bank to feel grand, some riads are more luxurious and naturally pricier, but plenty won’t cost you an arm and a leg and are equally as lavish. It doesn’t matter which one you pick, unlike cookie-cutter hotels, every riad has its distinct features, and no two are alike. Each one has its own story. Why not discover the best of Morocco for yourself on the Riads and Kasbahs tour? You’ll explore Morocco’s riad architecture from Fes to Marrakech.